Sophomore Margaux Thompson had 14 kills and 20 digs to help the Youngstown State volleyball team sweep Saint Peter's in the 2018 season opener. The contest was the first contest for both schools at the Bucknell Invitational in Lewisburg, Pa., and it was YSU's first match under head coach Aline Scott. 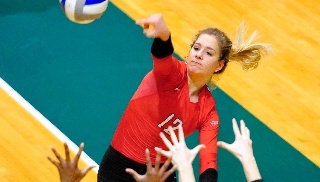 Thompson had 12 of her kills over the final two sets as YSU earned consecutive 25-20 wins. The Penguins had to battle back from a 22-18 deficit in the first set and outlasted the Peacocks 28-26. Aleah Hughes, playing in her first match since 2016, had five of her 14 kills in the opening set, and Reis Zandier posted 23 digs in her first contest at libero. Redshirt freshman setter Alexia Byrnes registered 37 assists in her collegiate debut. "This match went just as I thought it would," Scott said. "We had some nerves and were a little shaky to start until we settled into our rotations. The team showed the ability to adjust to the match as it evolved, and that was the highlight for me. We battled, we showed composure and we were in rhythm. It was a good starting point to the season." Saint Peter's had 16 kills in the opening set as it pushed the Penguins, but the Peacocks were held to 11 kills combined over the final two. Youngstown State ended with a 53-27 edge in kills and an 83-67 advantage in digs. One of eight kills in the first set by Alanis Alvarado gave Saint Peter's its largest lead of the match at 17-12. The Peacocks led 22-18 before YSU scored five of the next six points behind three kills from Hughes to knot the score at 23. Morgan Tippie and Erin Kalahar teamed up for blocks to tie the score at 23 and at 24, and Sarah Varcolla's fifth kill of the set gave the Penguins the 28-26 win. While YSU played from behind most of the first set, it trailed just once at 4-3 in the second. The Penguins had six kills in a 9-2 run that allowed them to take control at 19-11, and the Peacocks got no closer than four. Neither team led by more than three in the third set until two kills by Kalahar and one by Hughes gave the Penguins a 20-16 advantage. Saint Peter's got within one at 20-19 before YSU closed out the win with a 5-1 spurt. Four different Penguins had kills, and Giovanna Kuntze had an ace in the final stretch. Youngstown State will play two matches on Saturday, beginning with a contest at 10:30 a.m. against NJIT. The Penguins will also play the host Bison at 5 p.m.